True asparagus taste to delight many! Enjoy asparagus throughout the year! 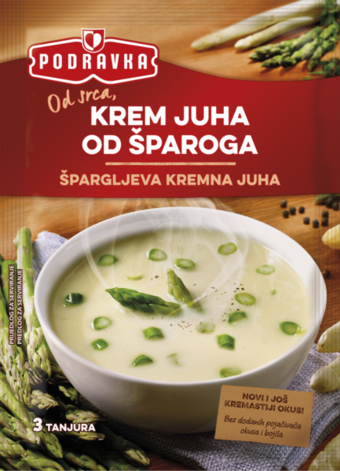 Characteristic asparagus taste is the result of a careful combination of green and white asparagus and selected seasonings. It is suitable for vegetarian diet. One package brings you 4 plates of delicious, creamy soup. empty the contents of the package into 900 ml of lukewarm water and stir with a whisk until the soup boils. Simmer for 5 minutes, stirring constantly. At the end of cooking add 100 ml of milk, stir and let the soup boil. .
wheat flour, table salt, corn starch, whey powder, vegetable fat, flavour enhancers (monosodium glutamate, disodium inosinate, disodium guanylate), dried white asparagus 5%, sugar, flavourings, hydrolyzed corn protein, dried green asparagus 0,8%, spices, acid (citric acid). May contain traces of celery and eggs.